The issue appears to be an authentication issue with users being continually prompted for passwords which are then rejected. There is currently no one solution that fixes the issue for everyone, so for the moment, avoid updating to 10.14.4 if you use Gmail or any of the G Suite apps. This macOS update was released on Monday. It introduced further Dark Mode features plus integration for the Apple News+ service. User Ken Graham posted about it in an Apple Support thread which currently has 344 people noting that they have the same issue. "Just update[d] to Mojave 10.14.4 and now Apple Mail will not connect to one of my Gmail accounts," wrote Graham. "This issue is unique to Apple Mail as I can access the Gmail account using Spark on the same computer." If you are affected by this issue, it manifests in one of two ways. The more benign manifestation is the "disconnected" symbol next to the account in Mail, which clears after a click —but may pop up again. The more profound problem sees users get caught in a cycle of being prompted to re-authenticate the account. "The issue puts me in an endless loop," says Graham. 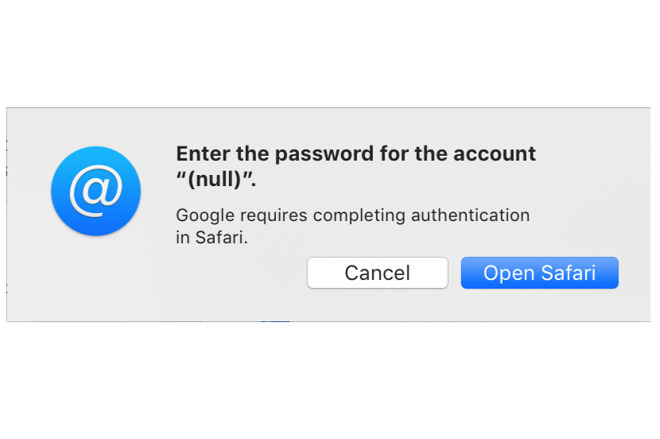 "I get a notification 'Google requires completing authentication in Safari.' This takes me to a Sign in dialog where I enter email account and password. Password is correct and accepted, after which I'm back in the loop again asking to enter Google Password." While Graham's problem is specifically with Gmail via Apple Mail, others have reported similar issues with their G Suite accounts. Apple has yet to comment publicly on the issue but some commenters on the support thread report having spoken with Apple and claim to have been talked through a fix. This allegedly involves removing your Gmail and then manually adding it back again as an IMAP account. Since you appear able to access Gmail via other apps on the Mac and that iOS is unaffected, however, the best option is to wait for Apple to issue a fix. And in the meantime, not update to 10.14.4 if you haven't already.